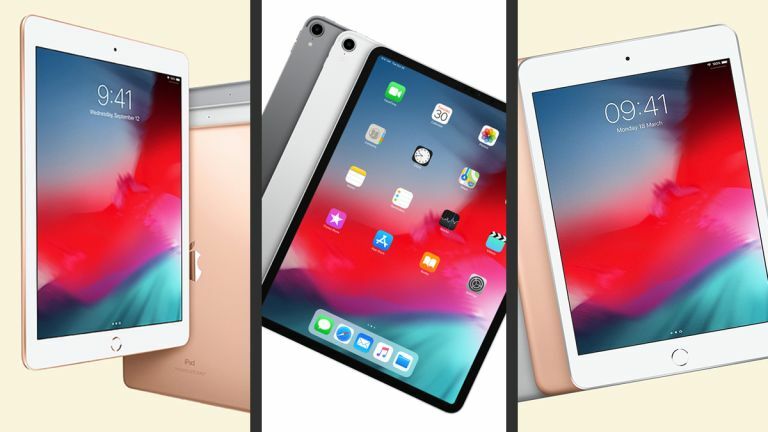 It's been quite a year for iPads, with Apple refreshing pretty much its whole tablet line-up during the last 12 months – a new entry-level iPad, two new iPad Pros, and most recently the return of the iPad Air and the iPad Mini. You've got five separate models to pick from. Working out the one that's right for you can be tricky, but we're here to help – we'll pick out the differences between the various models as well as the similarities, so you can make sure you're not spending your money on features and specs you don't actually need. Every iPad is a balance between portability, performance, and price – you need to decide which of those are most important to you. Are you buying to a budget? Do you need to do video editing on the go? Do you need something you can squash into a backpack? Remember that all of these iPads run the same iOS 12 software, which will be replaced by iOS 13 during the course of 2019. That means the same apps and the same functions no matter which iPad you end up buying, from the cheapest to the most expensive. The differences then come down to the size and resolution of the display, the power under the hood, and the accessories – all these iPads work with an Apple Pencil, for example, but not the same Apple Pencil (some work with the first-gen, and some the second-gen). Want the very best iPad that money can buy? We reckon the 11-inch iPad Pro, refreshed and launched in 2018, is it. There's so much to like here, from the gorgeous 2,388 x 1,668 pixel resolution display, to the A12X Bionic chip and the outstanding speed it brings with it. All the bells and whistles are thrown in, including upgraded audio, ProMotion and True Tone (for variable refresh rate and screen colour temperature respectively), and a rear 12MP camera with stabilisation. The latest iOS 12 software is on board as well, of course. We also like the Apple Pencil and Smart Keyboard Folio accessories, improved for the 2018 iPad Pro refresh. So what's the downside? Well, it costs an awful lot of money – especially when you consider the basic iPad (see below) has a lot of the same functions and features. How can the ultimate in iPads be number two in our list? Simply because we think the 12.9-inch screen size is too much for most people – if you're using your iPad Pro on the couch or with one hand, then we reckon the 11-inch form factor is going to suit you better. There's also the price to consider: this is even more expensive than the 11-inch model. Ramp up the specs to the max in terms of storage and cellular connectivity, and you're paying an eye-watering amount of cash for what is still just a tablet at the end of the day. All that said, if you have the budget and you want to get the fastest, best designed, biggest iPad out there then this is it. The 12.9-inch iPad Pro runs a 2,732 x 2,048 pixel resolution display, with more RAM than the 11-inch model, and the same A12X Bionic processor. Buying an iPad right now puts you in an interesting position because here we have the entry-level 9.7-inch iPad – newly refreshed for 2018 – which does everything the iPad Pro does, pretty much, for less than half the price. So why wouldn't you buy this model? Well, there's no Face ID, so Touch ID and the associated bezels are still in evidence. First-gen Apple Pencil support is included, but there's no official Apple keyboard, so you need to take the third-party route. And the screen isn't quite as big, or advanced in terms of its technology. You've also got the less powerful (but still very fast) A10 Fusion processor inside. These don't seem like terrible trade-offs for all the money you save – and considering it still runs iOS 12 just about as well as the iPad Pros, we think it's the best option for most people. Welcome back then to the iPad Mini – this is technically the iPad Mini 5, though Apple is just calling it the iPad Mini, and it doesn't look much different to the iPad Mini 4 that first went on sale in 2015, with the same 7.9-inch and a design incorporating Touch ID. New this time around is a processor upgrade to the Apple A12 Bionic chip, as well as support for the Apple Pencil (though only the first-gen version). If a bigger iPad is just too big for you, then the iPad Mini might just be the compact slate you're looking for. That size really is the main reason for buying this – it's actually more expensive than the entry-level iPad, which is why it's a bit lower in our list. You're paying for a more compact form factor, with less of a weight in your bag and a smaller size for carrying it around. You can think of this as either the third-gen iPad Air or the successor to the 10.5-inch iPad Pro that made its debut in 2017 – it's sort of a mix of both. It does come with Apple Pencil support now, though only the first-gen version, not the wireless second-gen version. The internals have also been given a revamp, so you get an Apple A12 Bionic chip to make sure everything is suitably nippy and to keep your tablet lag-free for the next few years. The design keeps the Home button and Touch ID, like the tablets that it's replacing. So why is it so low in our list? Well, one tablet had to be last – not because it's a bad tablet, but rather because it falls awkwardly between the expensive and polished iPad Pros and the affordable, old style iPad and iPad Mini, so it's hard to know who exactly it's for.